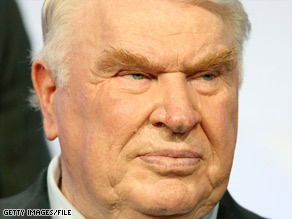 Legendary football coach and broadcaster John Madden is retiring, he announced Thursday. “It’s been such a great ride … the NFL has been my life for more than 40 years, it has been my passion — it still is,” he said in a statement released by NBC Sports. Madden, 73, was a Hall of Fame coach for the Oakland Raiders, but is best known to millions as an ebullient football commentator. He won 16 Emmy awards for outstanding sports analyst/personality, NBC said.